I am a grandma. All eight of my grandchildren live at least a day’s drive from me. I don’t get to see all of their accomplishments and milestones. 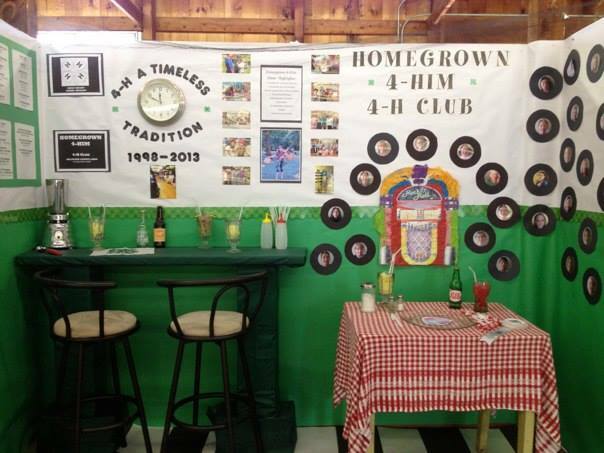 My daughter-in-law has found a fun way to keep all the long distance relatives up to date on the kids’ activities. I regularly get emails from her containing Smilebox photo collages. She does them for birthdays, new skills like riding a bike, vacations and even encounters with the tooth fairy. Recently when we visited our Florida family we got excited about their tadpole adventure. 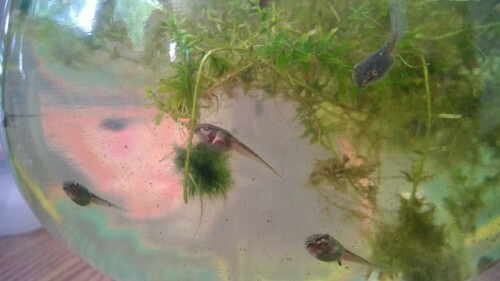 A neighbor gave them some frog eggs which they put into a fish bowl and added pond water and plants. We watched the eggs for a couple of days but had to return home before the babies arrived. We were disappointed that we couldn’t participate in the experiment but that disappointment dissolved quickly as we started getting regular updates about the tadpole population explosion. There were pictures and video on almost a daily basis. One day I received this Tadpole Smilebox in my email. As I watched the videos and looked at the pictures I realized that this would be a wonderful way to share what goes on in our homeschool adventures. Perhaps you don’t know what Smilebox is all about. Smilebox is a photo sharing service you can subscribe to that allows you to use your own photos and videos to make birthday cards, announcements, and many other personalized creations. You can add clip art and music too. It works like an online scrapbook that you can either keep for yourself or share with anyone who has an email address. Over the past several years, my daughter-in-law has sent out over 300 Smilebox creations to share the activities and celebrations of her children. Smilebox is a great way to share what you are doing in your homeschool with family. It certainly is a wonderful surprise to be included in the lives of my grandchildren but it might also be a good way to convince the critics. We all have those who might think our homeschooling efforts are not so wonderful. Perhaps sending a Smilebox would soften their opinion a bit. You never know! The longer you homeschool, the more “stuff” you seem to accumulate. It’s hard to part with all those projects and the memories that go with them. Creating a Smilebox is a great way to preserve the memories without taking up shelves of space in the basement. Younger students can contribute to a Smilebox that mom is designing while older ones can easily learn to create their own Smileboxes. Once students learn the techniques to creating a Smilebox, the possibilities are endless. They can use them to document unit studies and book reports. If they include video, it gives them a chance to work on their narration skills as they describe what is happening. They can learn about design and layout for the best visual effect. It’s like creating a documentary all their own. To get started making your own Smilebox creations go to Smilebox.com. There is a free version but for $3.99 a month you can access the full selection of designs. I would recommend subscribing to get the most out of the service. To subscribe to Club Smilebox go here. 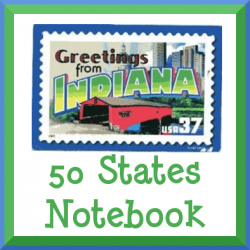 If you are familiar with the concept of notebooking, you will enjoy this website full of ideas for creating a notebook of the 50 states. If you have never considered doing notebooks with your students, this topic lends itself very well to learning the ropes. By doing one state at a time, you can easily get into a rhythm of working on it a little at a time. Here are some possible plans. You can work as fast or as slow as you want. You could do one state every couple of days for the entire school year and get a simple overview of each state. You could stretch it out and do one state a week and cover everything in two years. Perhaps pulling in a little history in the process. You could also allow several weeks to each state and use it for geography and regional studies for all of your middle school years. If you wanted to work with several students who are in different grades you could start the oldest one and when the next one is ready, have them work on each new state together until the oldest one is done and then complete the states the younger ones haven’t done yet. You could probably work with students from grades 5-9 at the same time, just requiring a little more effort from the older ones. There are many subjects that work quite well for notebooking. Try the 50 states and then go on to other topics. Soon your students will have a collection of their learning adventures to share with others. Here are a few other resources that might help.